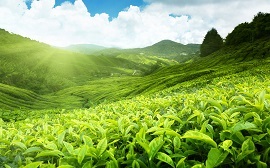 The Indian government is hopeful of achieving the target of exporting 300 million kg tea by 2020 with the support of industry and stakeholders, Tea Board said on Friday. With an objective of drawing up a roadmap for further enhancement of Indian tea exports, an interactive session was organised by the board to deliberate upon various issues being faced by the tea industry. Union Commerce and Industry Ministry’s Joint Secretary (Plantations) Praveen Bonigala interacted with the exporters to gather “first-hand knowledge about tea export scenario and to ensure greater cooperation among the industry members and the government officials. “The Joint Secretary congratulated the tea industry for setting an ambitious target of achieving 300 million kg of export by 2020 and said the target is very much achievable,” the statement said. Total tea exported during fiscal 2017-18 stood at 256.57 million kg. Bonigala flagged the issues related to quality standards of tea, sanitary measures, issues related to pesticide residue, non-tariff barriers and creation of infrastructure facilities by the government on PPP mode to help exporters.